Risoles are a popular Indonesian specialty - crispy croquettes with a creamy filling. I first had risoles when I lived in South America - they were prepared by an Indonesian friend. It turns out that risoles are quite popular in Brazil as well, although they are prepared in a slightly different way. Indonesian risoles have a crepe-like wrapper that you fill and roll up, and then deep fry. 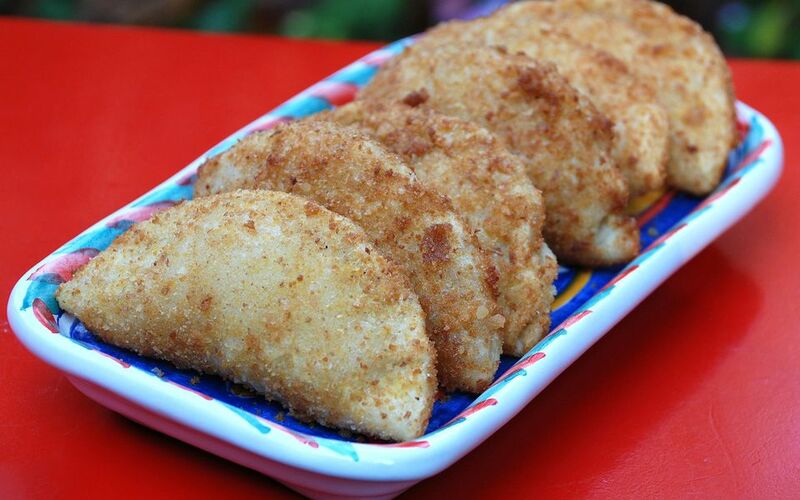 Brazilian risoles are like breaded empanadas - the dough is rolled out and filled, breaded, then deep fried. Both styles are delicious and can have many types of fillings. This recipe is for a standard (but yummy) chicken and cheese filling. Place milk, butter, and 1/2 teaspoon salt in a small saucepan. Bring just to a boil, then slowly stir in the flour with a wooden spoon until you have a stiff batter. Continue to stir over heat for 2-3 minutes more, until well mixed, then remove from heat and set aside to cool. Place the chicken breasts in a larger saucepan and cover with water or chicken stock. Cover, bring to a gentle boil and poach chicken until just cooked through about 15 minutes. Remove from heat and let cool, reserving cooking liquid. Shred chicken into very small pieces when cool enough to handle (you can use a food processor with the plastic blade for this). Cook the onion, garlic, and bell pepper in a couple of tablespoons of vegetable oil until they are soft and fragrant. Add the shredded chicken to the vegetables with 1 cup of the reserved chicken broth and the cube of chicken bouillon. Cook, stirring until most of the water is absorbed or evaporated. Stir 2 tablespoons of flour into the chicken mixture and cook for 1 minute. Stir in the milk and cook until mixture is thickened and creamy. Remove from heat and stir in the cheeses. Season with salt and pepper to taste. Knead the milk and flour dough lightly, adding a little more flour if necessary, until smooth. Pinch off a small piece and roll it on a lightly floured surface into a 4-inch circle (about 2 mm thick). Continue with remaining dough, stacking the circles of dough as you go. (Or roll out half the dough into a large rectangle and cut circles with a large round cookie or biscuit cutter, then repeat with the other half of the dough). Place about 1 tablespoon of the chicken mixture inside each circle of dough, and fold in half to close. Seal edges firmly. In a shallow bowl, whisk the eggs together with a 1/2 teaspoon salt and 1/2 teaspoon sugar. Place the bread crumbs in another shallow bowl. Dip each pastry into the egg wash, and then into the bread crumbs. Set aside on a plate. Heat 2 inches of oil in a heavy skillet with tall sides to 350 degrees. Fry the risoles in batches until they are golden brown. Drain on paper towels. Serve warm. Risoles may be kept warm (or reheated) in a 200-degree oven for up to an hour. Risoles may be prepared and breaded, then refrigerated for several hours before frying.